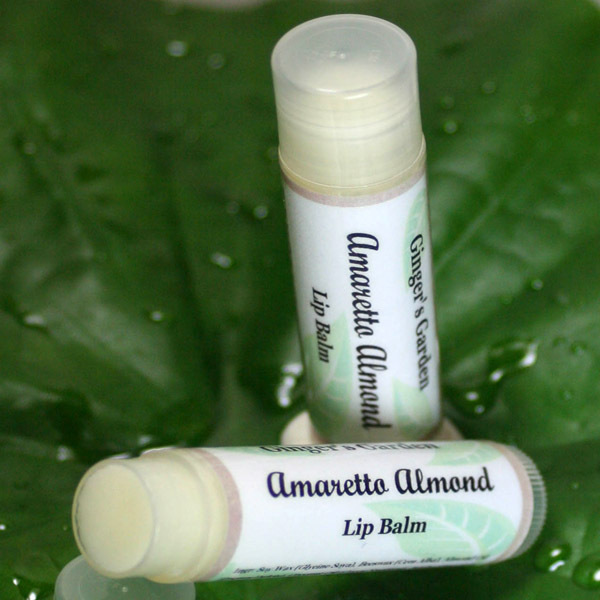 Natural Lip Balm Almond Amaretto with jojoba oils and mango butter that are moisturizing and soothing for your lips. I have combined the finest natural and food grade ingredients to help soothe your lips and add moisture. This Almond natural botanical lip balm is lightly flavored and lightly sweetened. Almond flavor oil that I use is made from natural flavor constituents. This lip balm is nice and lightweight, yet it will do its job beautifully. Treat your lips with some tender loving care and buy Ginger's Garden Natural Almond Amaretto lip balm. Comes in a swivel up tube. Use as often as needed. Each tube comes shrink wrapped for your protection. Almond Amaretto natural botanical lip balm makes a unique gift. Ingr: Soy Wax (Glycine Soya), Beeswax (Cera Alba), Almond Oil(Prunus Dulcis), Coconut Oil (Cocos Nucifera), Jojoba (Simonsia Chinensis), Mango Butter (Mangifera Indica), Vit. E, Natural Flavor, Sucralose.